Complete the sentences below using the following prepositions. Which of the above options can be used to complete these sentences. Smaller family units have become more common ………. recent decades. One of the main reasons ………. family units becoming smaller is finances. There has been a fall ……….. in the number of families with more than four members. Many children do not have a close relationship ………… their grandparents. Nowadays, less emphasis is placed ……….. close relationships between the generations. Children of working parents are often left alone ……. extended periods of time. Smaller family units have become more common in recent decades. One of the main reasons for family units becoming smaller is finances. There has been a fall in the number of families with more than four members. Many children do not have a close relationship with their grandparents. Nowadays, less emphasis is placed on close relationships between the generations. Children of working parents are often left alone for extended periods of time. Below is a list of vocabulary for the topic of plants in IELTS speaking part 1. You can see that some questions might produce shorter answers and other questions require more detail and explanation. This is normal in speaking part 1. Yes, I do. I usually have at least one indoor pot plant in my sitting room such as a peace lily. Are you good at growing plants? No, I’m not. I definitely don’t have green fingers, unlike my grandfather who was really good with plants. I frequently have to buy new plants for my house when they die. Why do people grow plants? I think some people grow plants because it’s a pleasurable hobby that they can enjoy all year round. It is very rewarding to grow a plant, particularly when the flowers bloom. For other people, it is a way to make their living environment better. What I mean is plants can provide not only clean air but also greenery which is supposed to be uplifting for the spirit. Paraphrasing in IELTS is essential for a high score in IELTS. This page contains tips on paraphrasing to maximise your score. You need to learn to to identify paraphrases in IELTS listening and reading. For IELTS writing and speaking, you need to learn to paraphrase using your own words. Students who are good at paraphrasing will do better in all parts of their IELTS test. The reasons for increasing levels of pollution are the development of industry and air travel. The causes of rising levels of pollution are the growth and expansion of industry as well as the number of people travelling by air. Here is a list of how the sentence was altered using synonyms. Not all words need to be changed for a high score in IELTS. You can see from the example above that some words have remained the same “levels of pollution / industry / air). This means you need to decide which words to paraphrase and which words to keep the same. Decide which words you can successfully paraphrase and which ones you will keep. Be selective. A high level student knows when to change words and when now to change words. Here is a link to more practice paraphrasing for IELTS. The more mistakes you make with vocabulary in IELTS writing and speaking, the lower your score will be. Paraphrasing is a skill. Synonyms do not have exactly the same meaning and cannot always be used at the same time. Watch this video below to get useful tips on paraphrasing for writing task 1 and writing task 2. Many people are unhealthy because they fail to eat well and exercise. This can be paraphrased by changing the word form of “unhealthy”, “fail” and “exercise”. Many people have poor health because they are failing to eat well and are not exercising enough. You can see from the above example, that many of the words are the same but the form is changed. This demonstrates excellent vocabulary skills to the examiner and will help you get a good score for vocabulary. It shows that you understand the words very well and can use them in different ways. If you watch the video below about writing an introduction for IELTS writing task 2, you will see again how words can be paraphrased by changing their form and using synonyms. You can see there are two clauses “Many people are unhealthy” and the second clause “because they fail to eat well and exercise”. Many people fail to eat well and exercise and, for that reason, they are unhealthy. Failing to eat well and not exercising are the reasons that many people have poor health. Of course paraphrasing will help your band score for the criterion of vocabulary. You can see that you need to show a range of words which means you need to paraphrase. But you also need to reduce your errors which means don’t try to paraphrase too much and don’t make mistakes. Following the above tips (using synonyms, not paraphrasing all words, avoiding errors, changing the word form and changing the sentence structure) will help you achieve the highest score. It is essential that you practice paraphrasing and using synonyms. You can find some paraphrasing practice lessons on the links below. My IELTS Reading Main Page which contains lessons for paraphrasing and using synonyms as well as lots of lessons for TFNG and other question types that appear in IELTS reading. My IELTS Writing Task 2 Main Page which contains lots of tips for essay writing as well as paraphrasing practice. 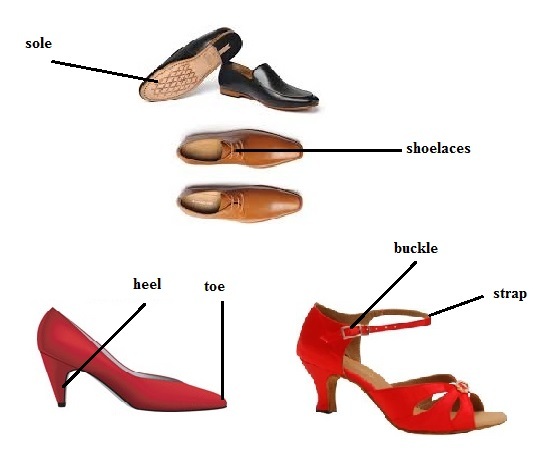 Learn useful vocabulary for shoes topic in IELTS Speaking Part 1 and improve your pronunciation. This topic is currently being used in the speaking test January 2017. This lesson provides vocabulary and audio to improve your pronunciation to talk about shoes. Try to use these words in your answers in your test. 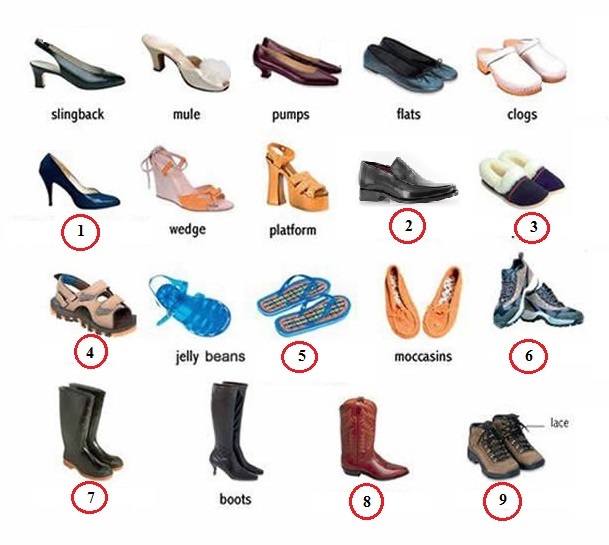 Can you label the missing shoes in the picture below? Pay attention to plural or singular nouns. Some answers will be plurals and some will be singular. Listen to the audio recording below and write down the missing words in the diagram below. Check your answers by clicking the arrow to reveal the answers below. Some answers are plurals and some answers are singular. Answers will be presented from left to right. Listen to the recording below. Write down the missing words you hear. Learn more useful language for shoes. Listen to the recording below and practice your pronunciation. The most common crime and punishment vocabulary with audios for pronunciation. This word list covers crimes, criminals, punishment, court proceedings and other useful words to write and talk about the topic of crime. Practice the words with the vocabulary exercise at the bottom of the page. These crimes are divided into crimes which are considered serious and those that are not. The list of crimes below are all nouns. This list shows the person relating to the crime (the perpetrator of the crime). This refers to punishment commonly used by schools and parents. penalty / punishment are synonyms but penalty is often used for both minor offences and major crimes. Complete the sentences using one or more words either from the above lists or from other vocabulary relating to this topic. The sentence must be grammatically correct once you have added the right word(s). The ………………. is the strongest deterrent against crime. The number of ……………….. is on the rise due to the impact of peer pressure at school and violent movies shown on TV. Teenagers are prone to ……………. aggressive behaviour. All people accused of a crime should be given a fair ……………. in a ………… of law. People who are convicted a murder from only ………………………. evidence should not receive the death penalty. The motives of a crime should always be taken into consideration. For example. there is a significant difference in the character of a person who commits ……………… murder and one who commits accidental murder. A ………….. sentence is more humane than capital punishment. Punishment should be the last resort. Instead criminals should be ……………………. People who commit ……….. crimes, such as traffic offences, should have their ……………….. revoked. Famous people, such as movie stars, should set a good ………… and ensure that they are good …………….. for young people to follow. …………… and the right to a fair ……………. should be the right of all citizens. Parents who inflict ……………… punishment on their children are showing children that …………….. is an acceptable way to deal with problems. Prison does not rehabilitate criminals, it only …………. them from society. …………….. service and rehabilitation is a better way to avoid criminals becoming ………………….